Today I pulled a card from one of my favorite tarot decks, The Gilded Tarot. The card is the Ace of Wands. Isn't this a beautiful card? Aces symbolize the start of a new cycle and Wands symbolize energy and action. So the Ace of Wands indicates new life, the start of a new venture or enterprise, new activities and things starting to happen. It can also be an indicator of your energy level. You feel excitement and passion about something -- sometimes you may not even know exactly why, but you feel a surge in energy, almost intuitively, nonetheless. If you've ever been to an amusement park and waited in line for one of the really fun or thrilling rides, you may be familiar with this feeling. The anticipation of standing in line, watching the people on the ride enjoy the excitement, the tightness in your stomach about getting onto the ride yourself and waiting for and experiencing the thrill. That is the energy of the Ace of Wands -- both anticipating it AND being in the energy. 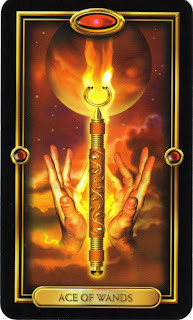 Take advantage of the Ace of Wands energy and create momentum as you move forward. Don't be surprised if you are filled with enthusiasm and passion, especially as you step into the space of what you are here (on earth) to do. Relish the feeling of inspiration and think of it as being "in spirit." Remember that passionate work is a gift. What is your passion? What do you want to bring about in your life? When you feel yourself brimming with excitement, this Ace of Wands feeling is your first clue that you are stepping into flow (the feeling of flowing with the energy of life, when time disappears and your essence is uniquely YOU)! This is when you are living your purpose. Doesn't it feel great and so very powerful from this perspective? Today, step fully into the space of the Ace of Wands and embrace its energy. Carry it with you ALL day. In fact, carry it with you ALL week. If it helps, pull out the Ace of Wands from your own tarot deck or print out a copy of the card above and post it on your bathroom mirror. Intentionally fill your life with the Ace of Wands energy...and see what happens! This reminds me of a movie I saw the other night: Whip It. Bliss, the main character, is trying to fit into her mother's mold of her as a debutante. But what lights her on fire is roller derby. Watching her blossom, watching her energy light her up, is priceless. I feel this when I write. When I have time and space to write. I'm with LL. Writing, when I have the time and space, connects me to this excitement. That, and understanding something in a different way than I have before. I don't know what to think. There is energy around me, but so much of it seems to be nervous energy. I feel like there is too much to keep up with, and it all seems to be on me. The computer crashed and now we can't get the wireless to work and DH needs it for a job; the cable got cut off today because I was underpaying the bill which increased without my knowing it; I just pulled off a party in my house which went well, but it was stressful; and my ovaries seem in overdrive this month and last night I dreamed I got pregnant. But here's the thing: I want to fly around. Not away, but around. I keep dreaming of flight. And now I'm thinking of hang gliding or sky diving or my childhood dream of being a real pilot. But I can't die. There's too much on me. I belong to others. But I'm thinking of what I would do if I didn't. Thank you for this gift of the Ace of Wands, dear Sheri, especially the image of carrying it all week. I am in lots of new ventures, lots of new clients at work, new energy to reorganize and declutter, improve my fitness and diet, a new blog venture, a new found appreciation for my many blessings, and a need to nurture my passions and creativity. Also, this wand that is reminiscent of a battle spear, I am reminded that it is okay and necessary that when this spurt of energy and passion to carry the wand is over, I will have a period of rest, recharging, and quiet when I lay the wand down. Thank you for sharing your insight, love, and gifts. I wonder what card you will pull to reveal yet another aspect? Blessings. Oh this is so MY card today! After not thinking this cycle would fly, I am ovulating and we are going forward with an IUI tomorrow! The picture on the card is perfect because I feel like a torch has been lit - thank you for reflecting my energy and vitality back to me! Be brave, and not succumb to fear. I'm being called to start an IVF cycle, one of the hardest things I've ever done in my life. I want to bring a child into this world that is the creation of my husband and I. But more importantly,I want to help our spirit baby become embodied in our lifetimes! Where do I start? Right now, I will set my intention to be a mother. I know I'm already a mother, but being a stepmom has always felt different to me. I think this relates to me in that I'm feeling I need to come out of my shell, be around people more, stop hiding out! Do something creative. I will carry this image with me through the week!